Stirrups Adjustment: 32" to 40"
Double T barrel saddle with black rawhide silver laced cantle and black rawhide braided horn. Saddle features a alligator print seat. Saddle has fully tooled basketweave tooled skirts, cantle and pommel. 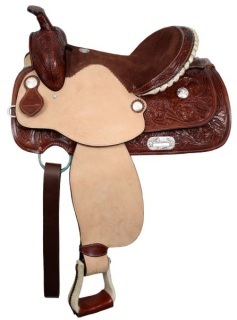 Saddle features roughout fenders and jockies with zig zag border tooling. Saddle is accented with silver spur rowell conchos. 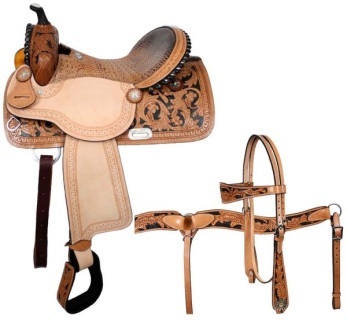 Saddle comes with matching headtall and breastcollar set with 5/8" X 7' leather split reins. Made by Double T Saddlery. Double T barrel saddle with silver laced black rawhide cantle, tooled roughout fenders and jockies. Saddle features fully floral tooled pommel, skirts, and cantle. 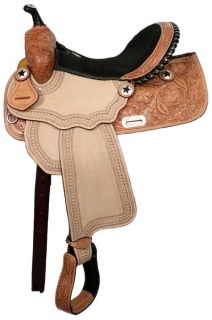 Saddle has inskirt rigging and features engraved silver cut out texas star conchos.